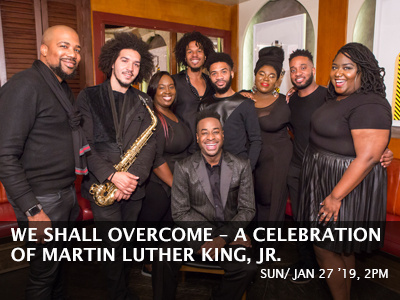 We Shall Overcome – A Musical Celebration of Martin Luther King, Jr. Inspired by the words and actions of Dr. Martin Luther King, Jr., this uplifting show features gospel singers and jazz musicians, led by acclaimed music director Damien Sneed, to tie together a living lineage of music and culture. Covering gospel, classical, jazz, and the music of Aretha Franklin, Wynton Marsalis, Duke Ellington and Steve Wonder among others, Sneed weaves these musical genres into a single electrifying performance.